A new product has been launched on the Irish market, which allows mechanics and technicians to carry out repairs to small sections of exhaust pipe, using an innovative pin and socket mechanism. 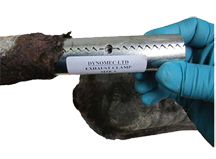 Dynomec has just launched its exhaust clamp, which facilitates repair to short sections of exhaust pipe. A short section of damaged exhaust can be spliced back together with an exhaust clamp that slips into the inside of the pipe and holds both ends securely in place. The clamps come in five sizes, that cover a range of pipe sizes from 26 to 70mm. Each clamp is around 120mm in length, offering a good grip on each end of the repair. 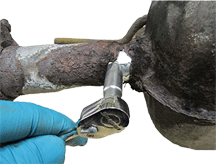 An extra amount of sealing can be achieved with the use of an exhaust joint sealant. 1. Slide the clamp into one side of the damaged section of the exhaust pipe. 2. Use a small flat screwdriver to slide the clamp into the other end of the damaged section. 3. Insert the supplied M6 bolt into the clamp and tighten with a 10mm socket until the clamp is firmly in place. 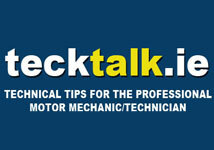 Contact Dynomec on 0044-1977-520-666 for introductory offers.